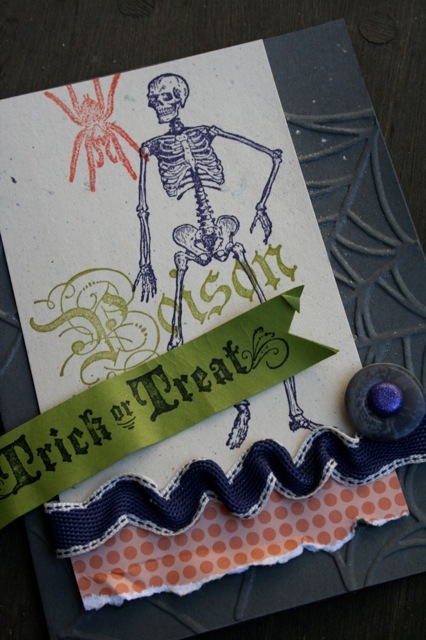 Today is the day of tricks and treats so I must say "Happy Haunting Everyone!" 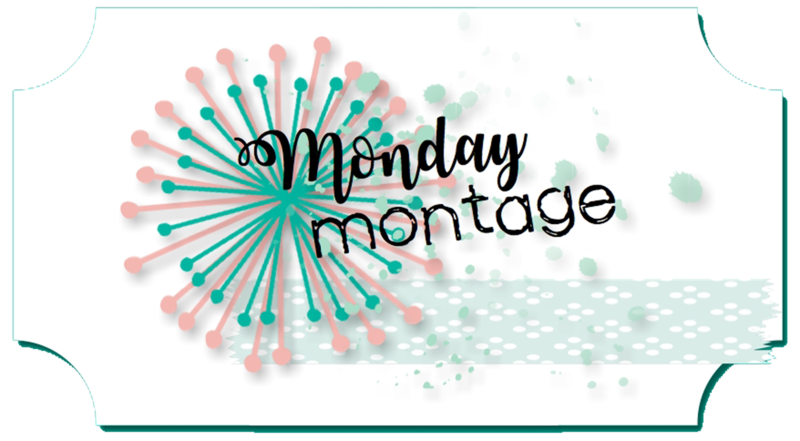 There is one last Monday Monster Mash Halloween Countdown blog hop hosted by Shirley. 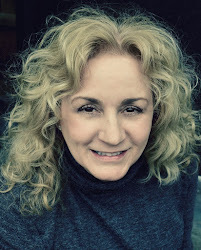 Click here to jump to her blog and join in the fun. 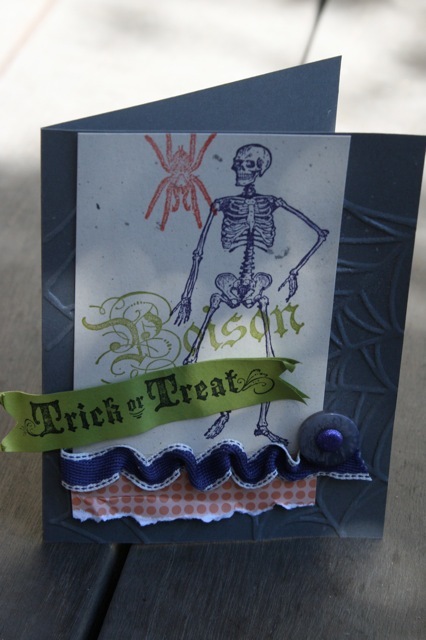 I have one last card to share and it features the Piece of Poison stamp set. My colors include Basic Gray, Concord Crush, Lucky Limeade, Calypso Coral, and White Confetti. When you have the right stuff you can whip up a perfectly wrapped gift in no time at all. 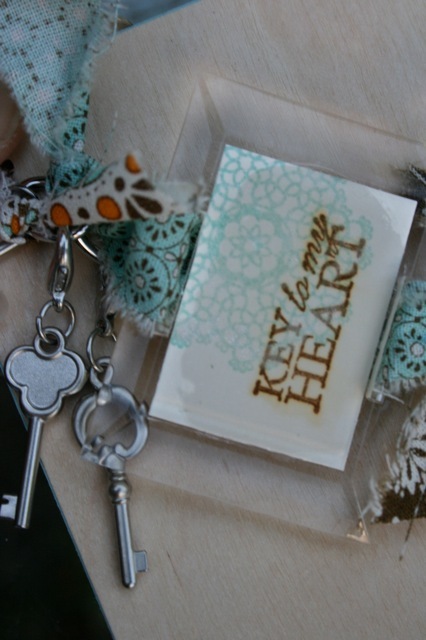 I have used just a few accessories from Stampin' Up! that coordinate with total ease to wrap a gift fit for a queen. First I layered Wild Wasabi Cardstock under the polka dotted print from the Holly Berry Bouquet DSP. Then I added the layers to the sides and top of a Kraft Box. 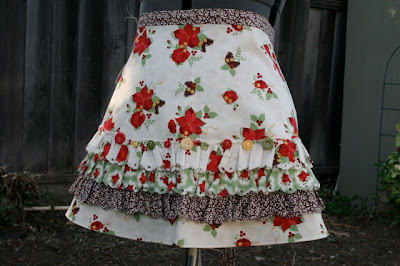 Next I brought Real Red 5/8" Satin Ribbon up and around the sides and tied the top with a six loop bow. 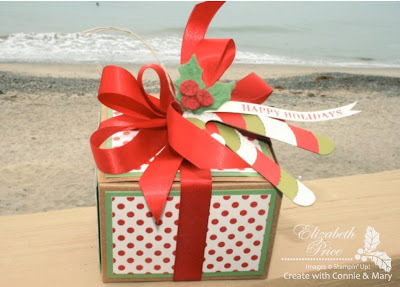 What brings the box to life are the two candy canes which I made using the Stocking Accents Bigz Die. A quick banner and a Winter Wishes Stitched Felt accent finishes the box for a completely cute touch. Today there are some super SUPER boxes, bags, and tags posted over at Create With Connie and Mary. All of the Designers have made something special to share with you all. We have just completed the Six Week Holiday Edition of Create With Connie and Mary and it was a total blast. If you didn't subscribe it is NOT TOO LATE. You can subscribe and have access to all 36+ tutorials as they are kept on the site long after the Edition is over. This way you can refer back to all the projects 24/7! 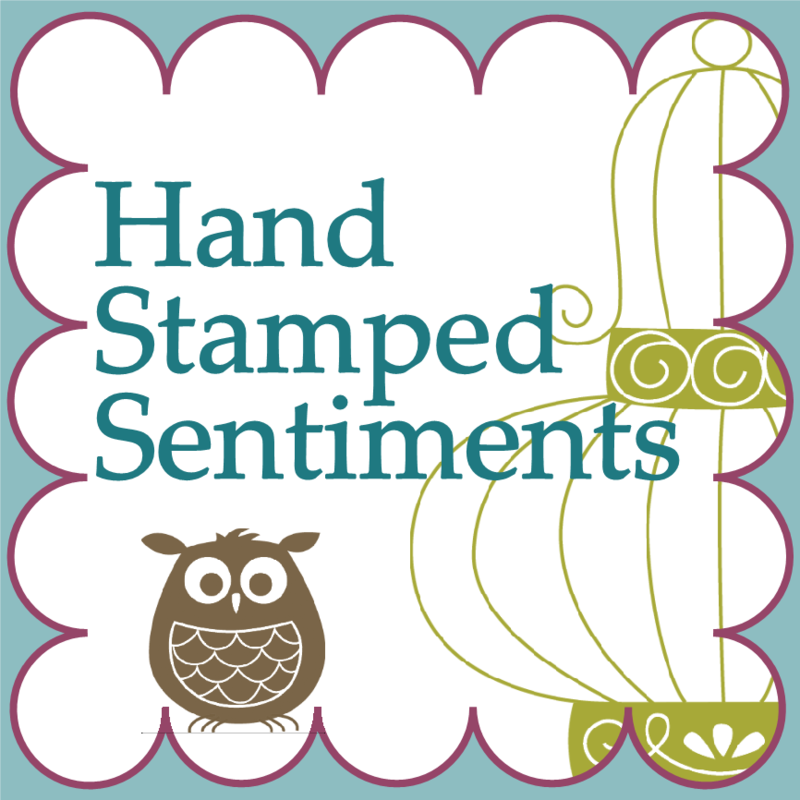 We had 6 weeks of exclusive samples with step-by-step tutorials featuring the products in the Stampin' Up! Holiday 2011 Mini brochure. 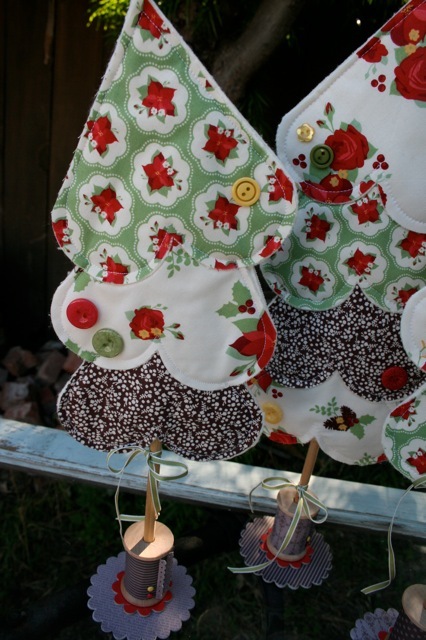 How about a trio of trees made with the Holly Berry Bouquet Designer Fabrics as part of your holiday decor. 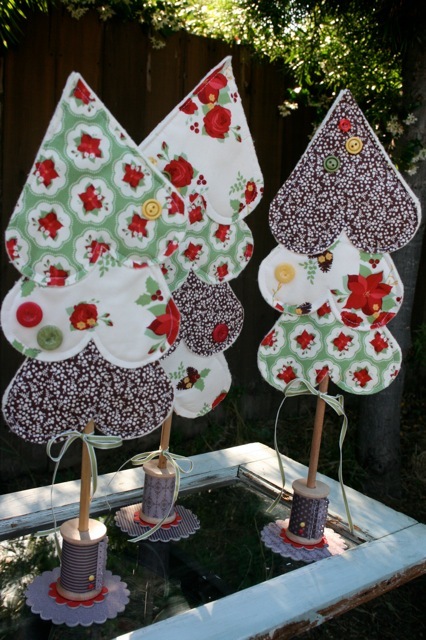 For these I cut the heart shapes using the Petal Cone Bigz L Die. Each up-side-down heart is backed with wool felt. The trees are based on 3/8" x 12" wooden dowels and then ever so slightly stuffed with poly fiber fill. The wooden dowels fit perfectly in some wooden spools I found at the craft store which I think makes for pretty stinkin' cute bases. 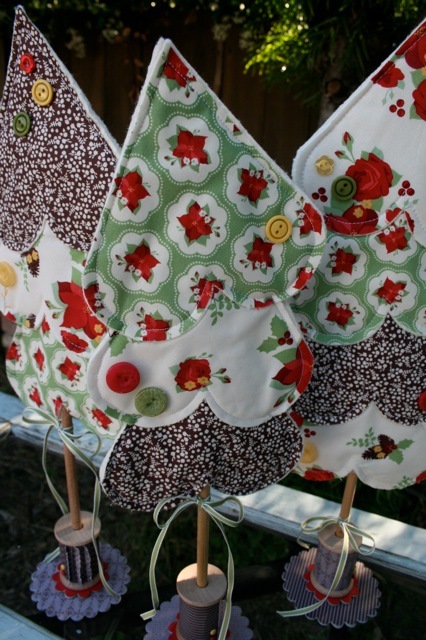 A few buttons give a little added bit of decor, yet still allow the fabric to remain the "star of the show." It's tricky to see in the photos that these are two sided. 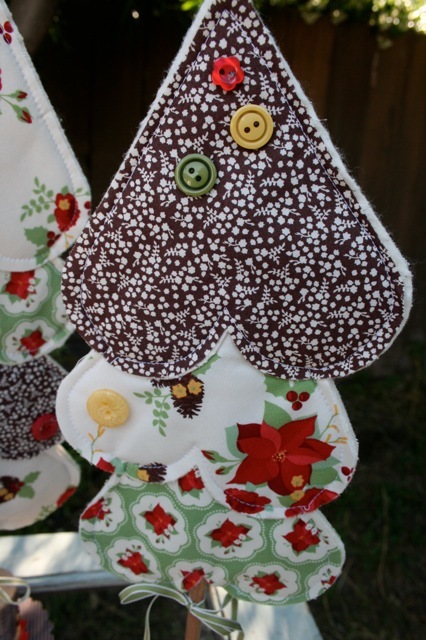 Each inverted heart/row of branches includes fabric, wool felt, another layer of wool felt, and then fabric. ... by the chimney with care by Julie B. My sweet and amazing friend put this card together and check the detail. She used the Simply Scored tool to make a background of bricks! And then she displayed these adorable stockings which she punched out using the new Stocking Builder Punch. 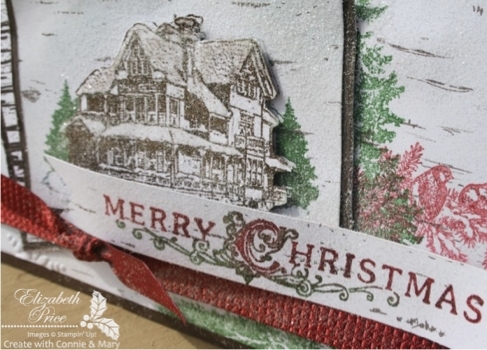 This week over at the Create With Connie and Mary Holiday Edition we are featuring the Stitched Stockings & Dear Santa stamp sets, the Stockings Builder Punch, the Holiday Stocking & Stockings Accent Bigz Dies, and the From Santa A la Carte stamp. Let me tell you that yesterday's project designed by Sandra Farrell is WAY GORGEOUS!!! 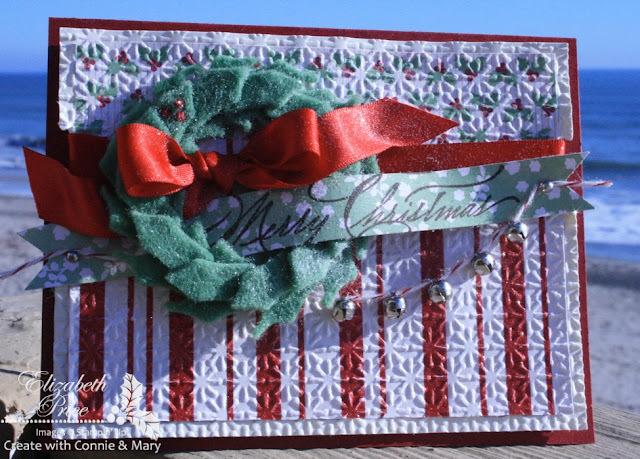 It's not too late you can still subscribe to the Holiday Edition of Create With Connie and Mary (details found on the top of the right of their sidebar). I had several extra crows from the Dollar Tree hangin' out just beggin' to be decorated. So, I got busy and gussied up another little something to crow about. 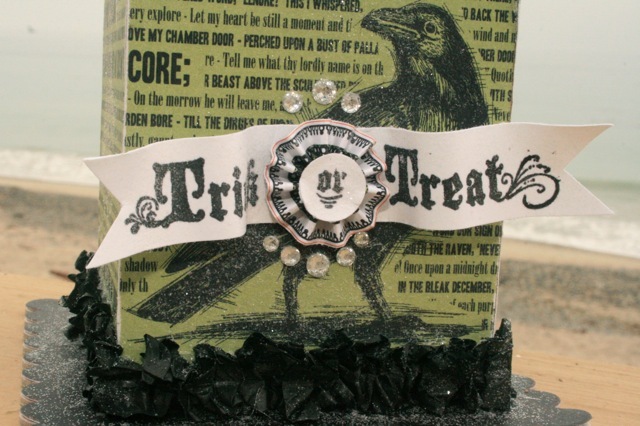 I mentioned earlier in a post that I was totally intrigued by the crow pictured in the Holiday Mini Catalog. I had to copy it which I did several times. 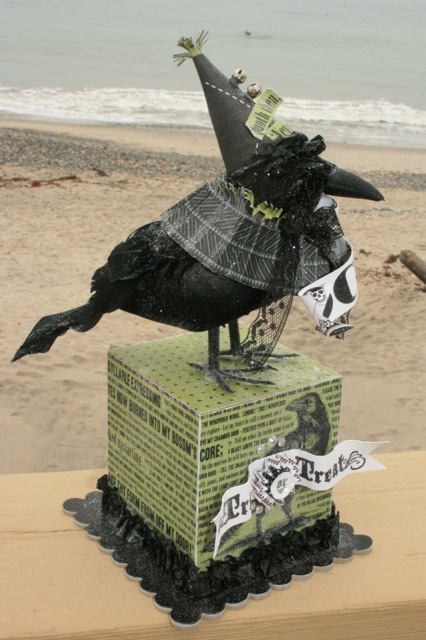 Well, the other day I was inspired to make another crow and use up some leftover papers from last year called Dark and Dreary. The DSP collections from 2010 were as amazing as this years patterns. I know, I know I am getting a bit wack-o about glitter, but I do have a tip for you. I always seem to want to add a few bits of bling after I have glittered my project and they never stick. So, add any rhinestones or pearls first before you glitter. And just as a reminder I like to spray cheap hair spray, then sprinkle the glitter, and then add another light coat of hair spray. My friends and I call it the "spray sprinkle spray" method. 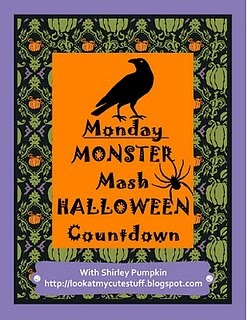 Now it's time to check out Shirley's Monday Monster Mash Halloween Count Down for this week. The big day is drawing near! Can't wait for Halloween. I am going to watch scary movies and eat lots of goodies AKA crap. Thanks to such inspiring products from Stampin Up! we can create works of happiness. 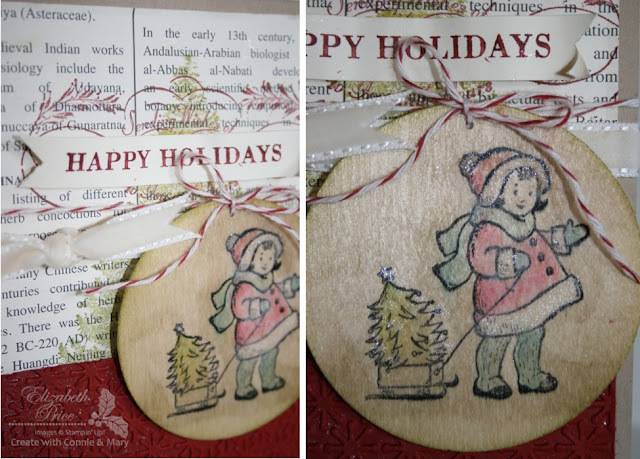 This card, which I put together for the Saturday challenge over at Create With Connie and Mary, totally reminds me of being at a cabin up in the snow. I started with the snowy cabin image which is chilly and cool. I stamped it twice on a piece of Frostwood Lodge DSP. I cut out just the cabin and added it directly on top of the second image with dimensionals. 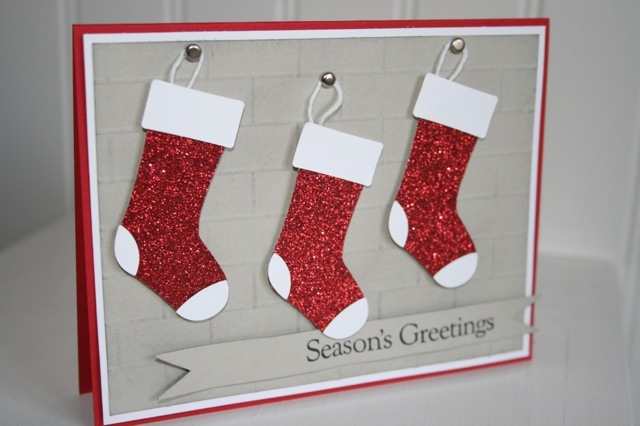 The last thing I added to this card was a few layers of glitter, which for me is the frosting. 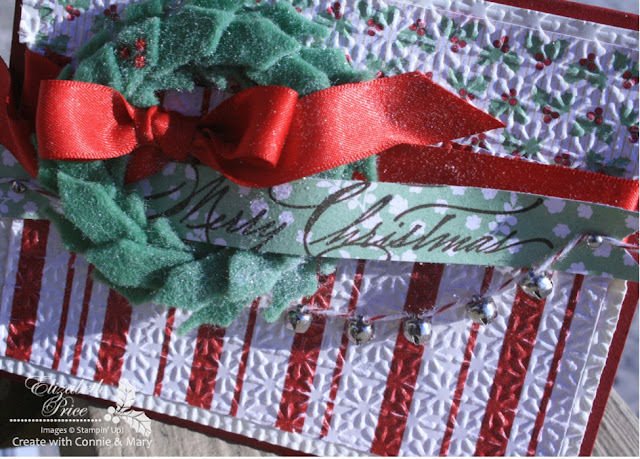 I added a thick layer of glitter to the roof of the cabin and then a random dusting to the entire card. I do believe I should attend GA (Glitterers Anonymous). 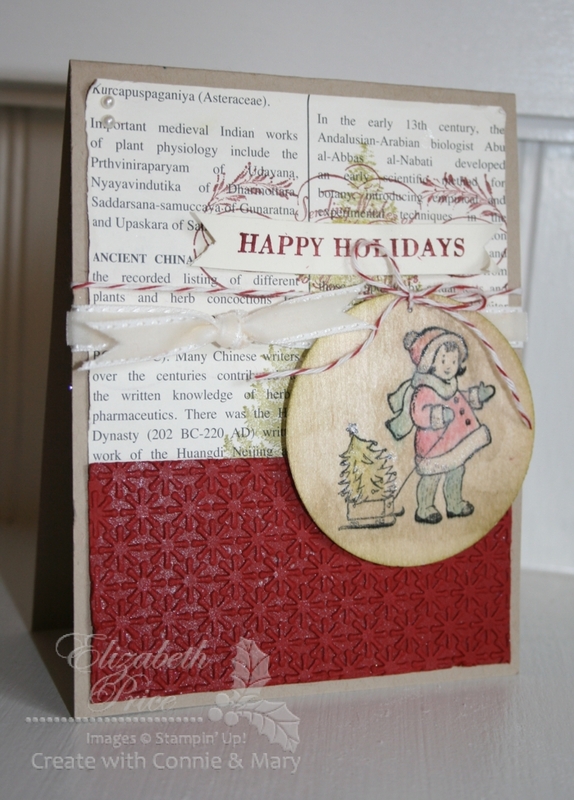 My favorite, yet totally random and unplanned, element of this card is the embossed snowflake on the top of the tree. Can you say meant to be? 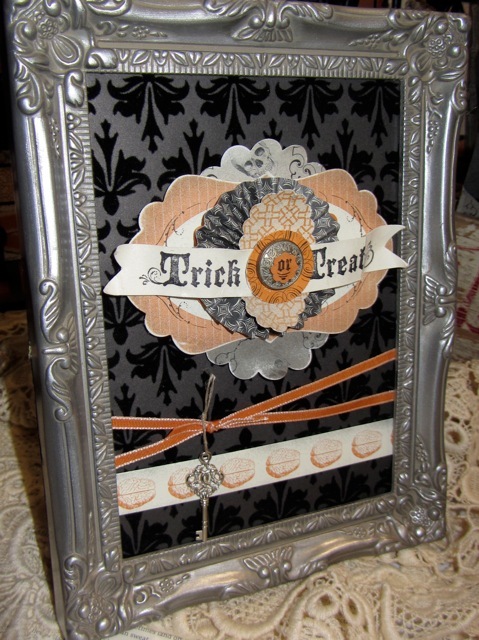 I mentioned that I made this for a challenge over at Create With Connie and Mary. Each of the Holiday Edition Designers have designed cards using this very same sketch (CCMC HOL5). 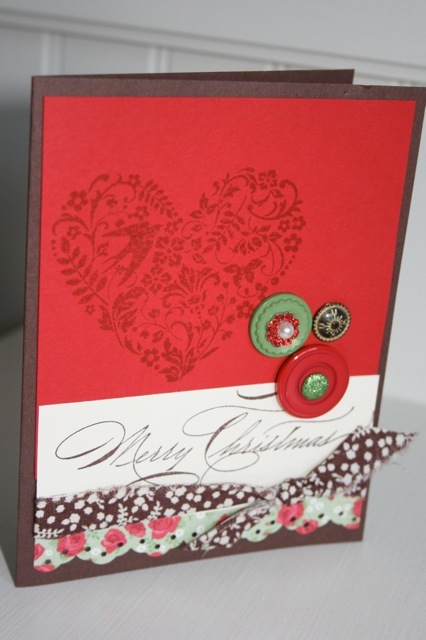 Now jump on over to the Create site to see more cards featuring this versatile layout. A while back I posted a table runner (click here to check it out) made from the Deck the Halls Designer Series Fabric. When I was finished I had a few extra pieces cut from the Pennant Bigz XL Die as leftovers, so I decided to throw together a pillow. Once I had pieced everything together I pressed open the seams and then traced the shape to make a pattern for the back of the pillow. 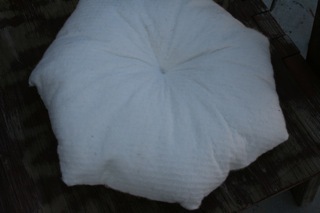 I used wool felt for the back and cheapy poly fiber fill to stuff the pillow. 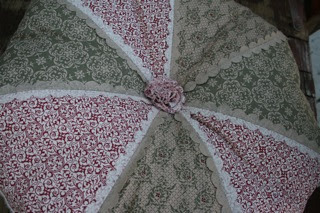 A fabric rosette finished off the center tuft. When I was little my brother and I would ask what was for dinner and every time the answer was something like "leftovers and like it" or "fix it and find out." 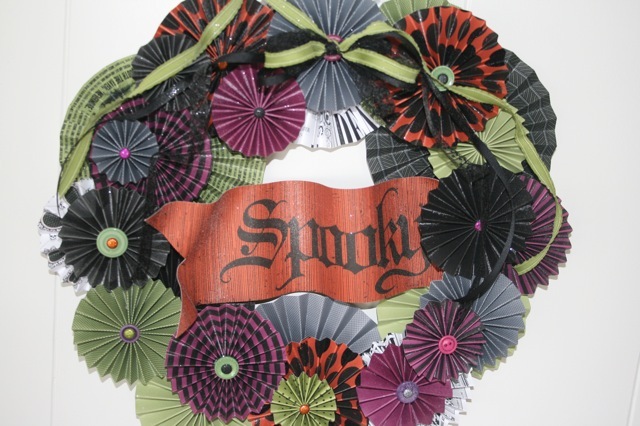 This medallion wreath is definitely a "leftovers and like it" bit of fun. 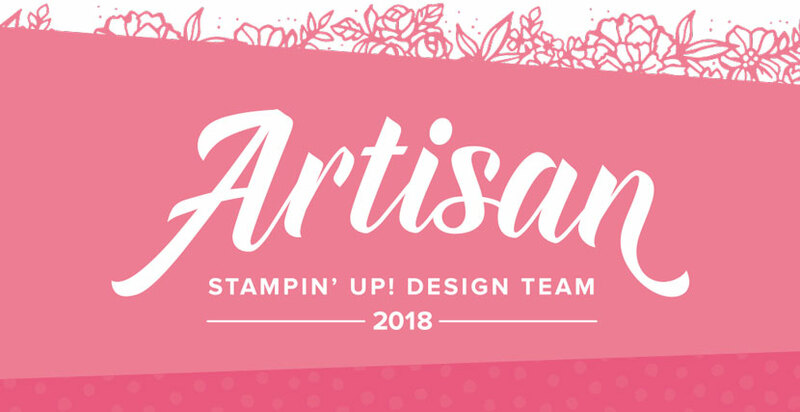 My mom had a bunch of pieces of Designer Series Papers from last years Stampin Up! catalogs that I had fun working with. 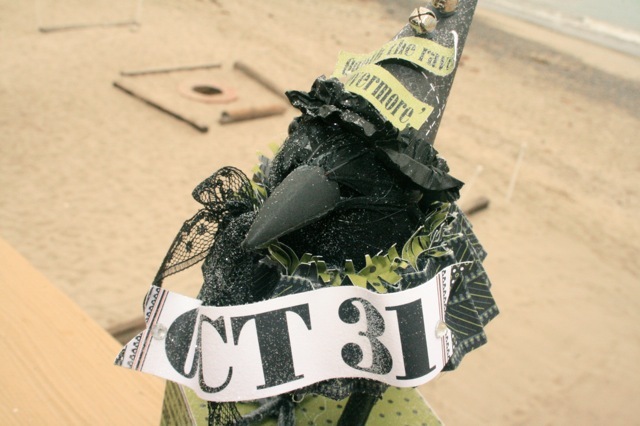 Follow Shirley's Monday Monster Mash Countdown blog hop, or join along and share your Halloween masterpiece. 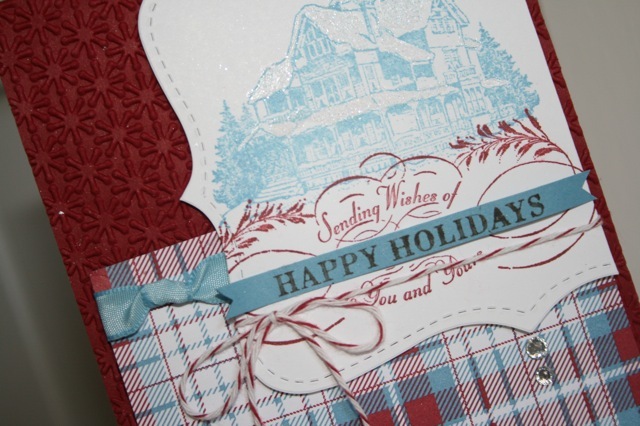 The Frostwood Lodge Suite is being featured this week over at Create with Connie and Mary Holiday Edition. This new suite is a perfect collection of everything woodsy and cozy. The Designer Series Paper patterns remind me of Christmas time at the cabin, seeing snow all around while sitting on the hearth by a big crackling fire, and hours of card games. 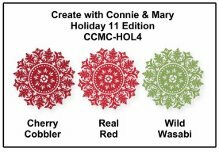 Check this color combination challenge from Create With Connie and Mary--it's Cherry Cobbler, Real Red, and Wild Wasabi. 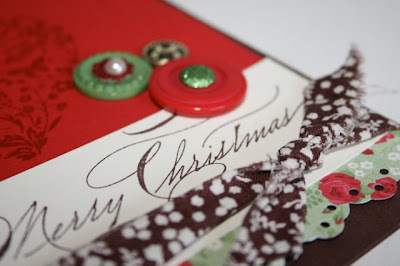 The two reds together are super gorgeous and the green adds a splash of fun. 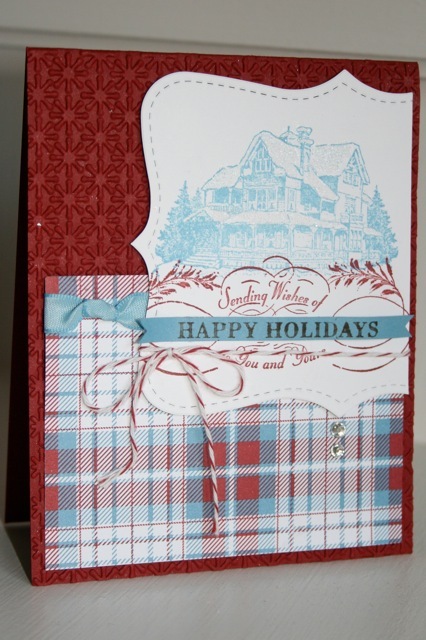 For my color challenge card I chose to use the Holly Berry Bouquet DSP layered onto a Cherry Cobbler card panel. Typically with this DSP I would have grabbed a piece of Real Red and not Cherry Cobbler, but that is what these color challenges are all about. They are to help us think outside the box. And I am jazzed with how this all came together. As of 1/27/12 a tutorial is available for this apron please click to here for the link. How about a demi apron for the holidays made from the Holly Berry Bouquet Designer Fabrics from Stampin' Up!? 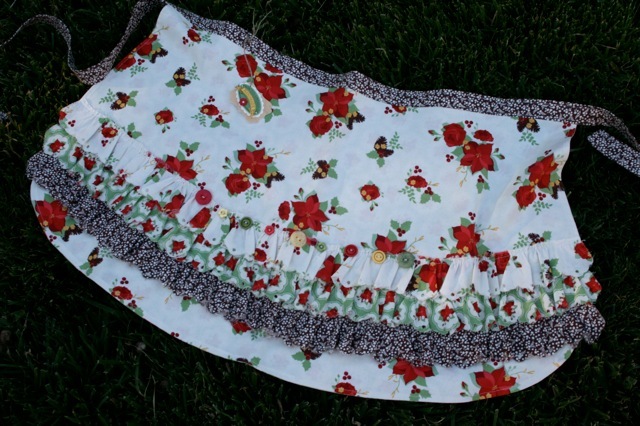 This apron is fully lined with a contrasting fabric and is totally adorable with the rows of ruffles and buttons. 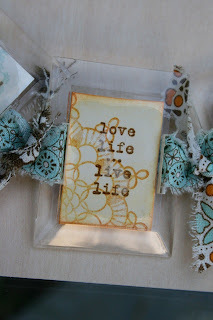 To easily cut the scallop edged ruffles I used the Perfect Setting Bigz Die (retired) from Stampin' Up! 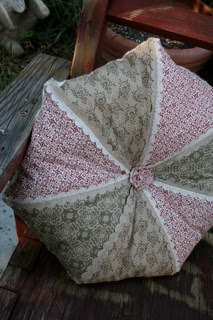 I placed a fold on the edge of the cupcake cozy section of the die to get a double wide scallop piece. 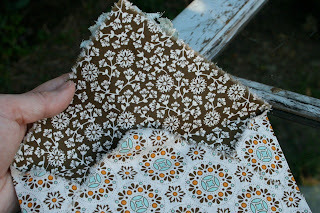 Then I stitched three of those pieces together to form one long scalloped strip. After I gathered the strips to fit the front of the apron and top stitched them on with out turning under any edges--I wanted the shabbiness. I did this with each print to create three ruffled rows. 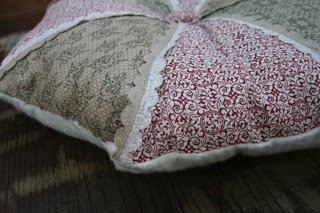 For a fun added element I hand-stitched a row of coordinating buttons to the top row of ruffles. Once I had the front of the apron completed I cut a piece of contrasting fabric to fully line the back and to add visual and actual weight to the overall piece. I stitched the right sides together, clipped and trimmed the curves, turned it right sides out, pressed, and then top stitched all around the outside edge. For the waist band and apron ties I cut three strips of a second contrasting fabric. 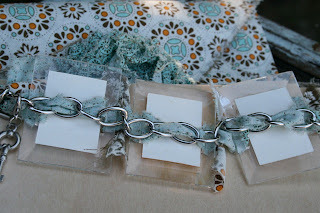 The middle strip was lined with interfacing while the sides were not. 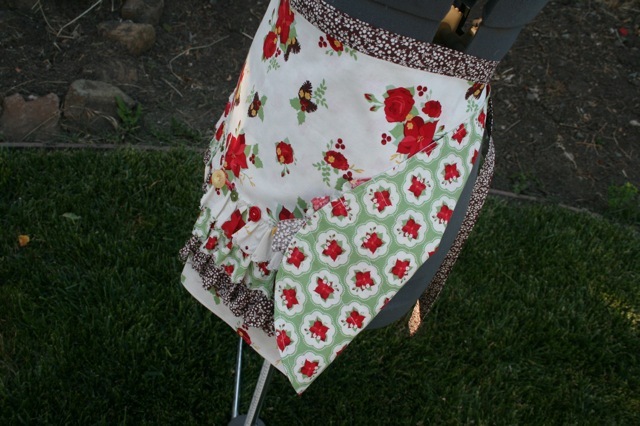 The entire waistband/ties were pressed and then top stitched to complete the apron. 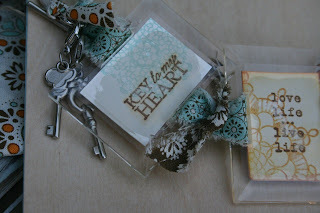 For added fun I included a hand stamped tag. I used a woodsheet, a little cardstock, and the stamp set called Creatively Yours. I clipped the tag onto the top of the waistband with a Vintage Trinket pin adn then the apron was ready to give as a gift. 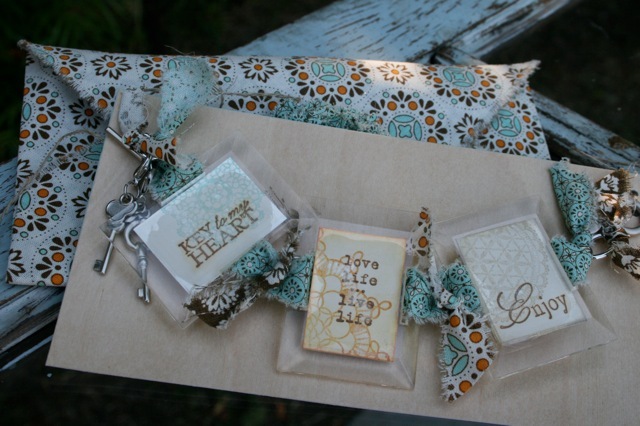 Hop on over to Passionately Artistic and Simply Designing for fun linking parties to see more clever hand made ideas. Click on over to Cute Stuff by Shirley or join in the blog hop below for some Halloween fun. A while back when my friends and I did the Santa Clara Scrapbook Expo at the end of setting the booth up we realized we needed just a few more items to fill a couple holes. So, we put this frame together in just a matter of a few minutes. We cased one of the samples for the Piece of Poison suite found in the Holiday Mini catalog and tweaked it just a bit to work in a frame. I really like the piece of flocked DSP from Morning Mocha which backs the entire frame. 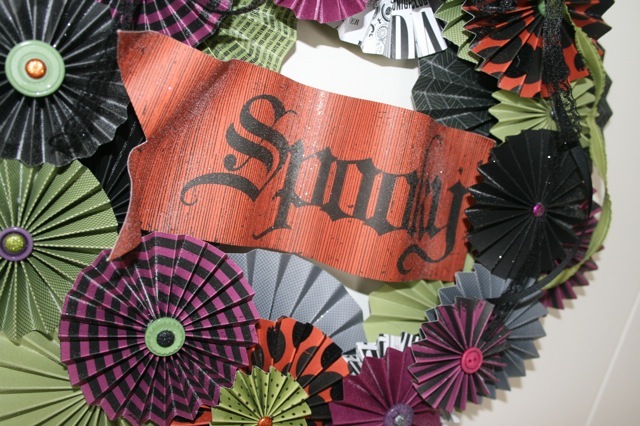 It reminds me of wallpaper in a scary funeral parlor. 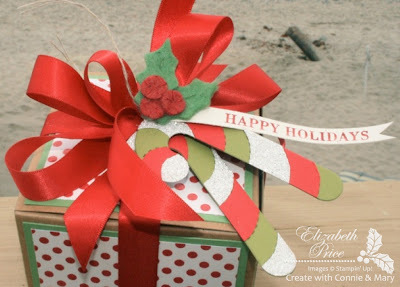 This week over at Create with Connie and Mary Holiday Edition 2011 we are featuring the Holly Berry Bouquet Suite in the Holiday Mini. This new suite is a great throwback to Christmas of yester-year which stirs up so many memories of past seasons. 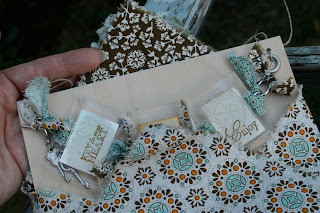 I just love the fabric, the dsp, the designer buttons, and ribbons of this suite and you will too! 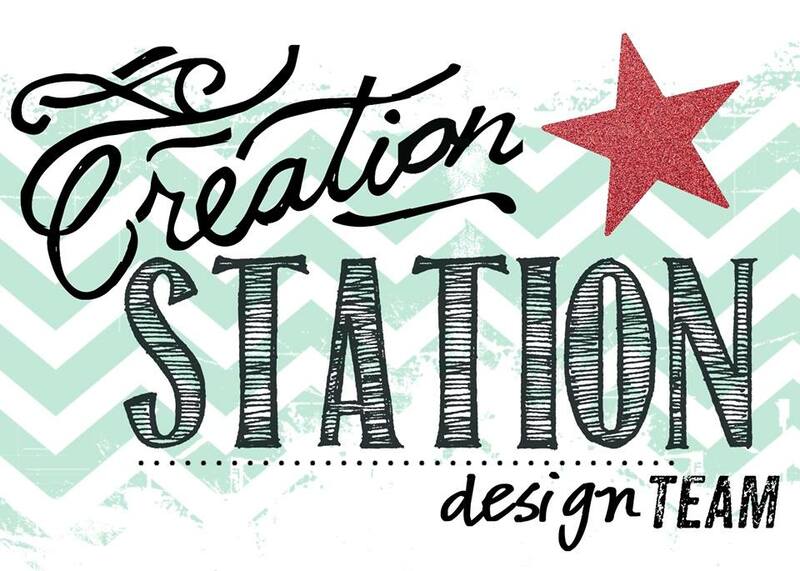 If you didn't know, over at Create with Connie and Mary, Saturdays are a special days during the Mini Catalog Edition Subscriptions. Each Saturday we all play along with either a sketch, color, or theme challenge. 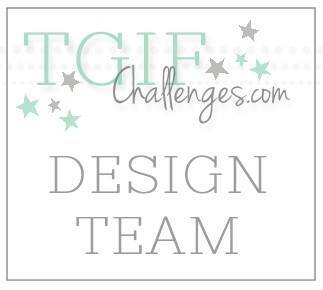 Everyone can see the Design Team Saturday Challenge cards, but only SUBSCRIBERS can enter the challenges! Each time a subscriber enters a challenge, their name is entered into a drawing at the end of the Edition. 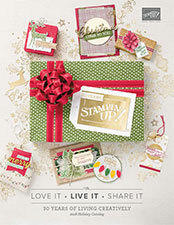 Prizes include two $75 Stampin' Up! 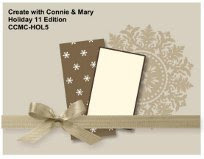 Gift Certificates and two FREE subscriptions to Create with Connie and Mary Occasions 2012 Edition. The only way to be entered into these drawings is to participate in the Saturday Challenges and you MUST be a subscriber. There are five challenges total and this is the third one! 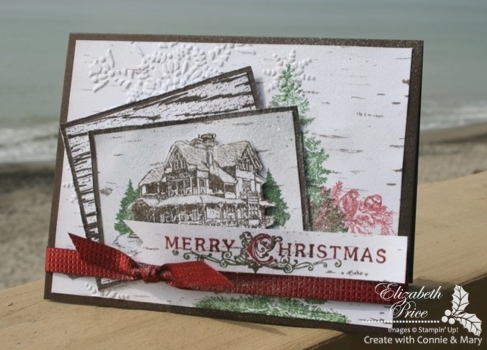 The challenge this week is Christmas cards that are extra special! Now I decided to design a card that uses my favorite stamp style images, something vintage. And now I give to you "Part Two" of last week's "Part One" Fabric Friday. And now for some close up pictures of the bracelet. And even closer views of each windowpane. One last view of the entire windowpane bracelet all packed, wrapped, and ready to give as a gift.